A Guide to Wet Floor Accident Injury Claims – How Much Compensation Can I Claim? If you have slipped on a wet floor, you will know how painful the consequences can be. But if you have slipped on a floor in a public place or business, such as a supermarket, or whilst at work or performing work duties at another site, you could be entitled to compensation. This guide to wet floor injury claims covers everything you need to know including how much compensation you could claim with our slip and fall compensation calculator, as well as wet floor signs regulations and their use and how to go about making a claim. The Wet Floor Injury Claim? When are Wet Floor Injury Claims No Win No Fee? How to claim for slip on wet floor incidents? After a slip on a wet floor, what can I claim for? What size award for compensation would I get for a slipping on wet floors accident? Have you had a slip on a wet floor in a supermarket? Have you had a slip on a wet floor at work? Public Place Accidents – Have you had a slip on a wet floor in a public place? What can cause a wet floor accident? 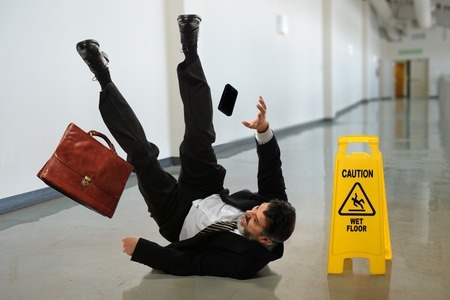 Why choose Accident Claims for your wet floor injury? A wet floor injury claim is made by someone who has suffered injuries as a result of slipping on a wet floor. It means that the accident was avoidable and happened because there was negligence in terms of duty of care. A quick example is that due to heavy rain, the entrance into a shop may become very slippery. The business would be expected to make this hazard obvious to customers and to take action to minimise the risk of slipping. If they didn’t and someone slipped, hurting themselves, this could be seen as a breach in their duty of care and thus, they would be liable to pay compensation for the injuries that person suffered. There is one issue that always causes concern to potential personal injury claimants and that is, how will they pay the legal costs associated with their case, especially if their claim is unsuccessful. The answer is to use no win no fee personal injury solicitors, like those you will come across if you choose Accident Claims to manage your personal injury compensation claim. But you need to be aware of what no win, so no fee means and make sure you read the terms and conditions a solicitor attaches to it. At Accident Claims, our no win no fee system is exactly that: if your case is not successful, you don’t pay any legal fees or costs. With some solicitors, if you lose your case, even with a no win and no fee policy in place, you may still have to pay some legal costs and other fees. Establishing duty of care – in other words, was the business or your employer in the position of providing a duty of care to you? If you slipped on a wet floor at work, your employer has a duty of care to ensure that any work areas are safe to use. They should also ensure that basic health and safety measures are in place, such as spills mopped up quickly, non-slip footwear, appropriate floor surfaces for the work being carried out in that area and so on. A breach in a duty of care – if there was a duty of care and this was found to be breached, then this places liability for the accident on the business or the employer etc. Injuries – if this breach of duty of care resulted in your being hurt and needing medical attention, then you have a compensation claim for your injuries. Accident Book – if you slipped on a wet floor at work or slipped on a wet floor in either a supermarket or other business premises, you need to ensure that they record the accident accurately in their ‘accident book’. This is a requirement under health and safety regulations. Gather evidence – if you can, try to photograph the scene and if there were witnesses to your slip on the wet floor, ask for their contact details. Their statement will prove invaluable to your legal team. Medical help – if you did suffer a slip on a wet floor etc and were hurt, seek medical attention. Some injuries are obvious immediately, but some can longer to develop. Get medical help. Non-economic damages – this is the amount of compensation you will receive for your injuries, along with any emotional impact that the injuries have had, or will continue to have, on you. How much is awarded to you will depend on the nature and severity of your injuries, along with the estimated time it will take to recover from them if this is an expectation. Economic damages – these refer to expenses or costs that have been incurred because of you being injured. For example, if you slipped on a wet floor at work and broke your leg, you may have needed personal care at home for a short time. If you paid for this, you could claim it back. This portion of the claim, sometimes known as special damages, also covers any medical and travel expenses too. Keep all receipts as proof of these expenses. There are many different kinds of injuries that can result from a slip or trip. Anyone who has suffered a slipped on a wet floor injury will know the painful consequences of doing so. Effectively, many of these injuries are ‘impact’ ones – the result of taking a slip and falling heavily to the ground. Even with a relatively minor slip, the resulting injury can be serious. It is also common for people to suffer more than one kind of injury. For example, slipping on a wet floor and falling backwards, landing heavily on your pelvis can not only result in a fractured hip but also a whiplash injury as your head was snapped forward and back in quick succession. Thus, the amount of compensation awarded to you in the event of a successful claim for slipping on a wet floor depends on the nature of your injury, how it affected you and how it may continue to affect you. This compensation table provides an idea of what compensation some injuries associated with slipping on a wet floor could attract in the event of a claim. This is not an exhaustive list of the injuries that result from a slip on a wet floor; it is merely a guide to some common injuries we see in claimants. Minor head injury £1,675 to £9,700 Slipping can lead to a fall in which someone lands heavily on their back. This can result in the head snapping backwards, hitting the floor. This can lead to cuts and abrasions, as well as cases of concussion. This band of compensation would be for head injuries with minor symptoms, such as a headache, and from which someone is expected to recover without any long-lasting issues. Minor back injury £6,000 to £9.500 The spine can be damaged after a severe fall and thus, this compensation bracket reflects injuries that may have required surgery and/or other kinds of medical intervention. It also covers claimants who may suffer from ongoing ‘nuisance’ injuries, such as pain, for some time after the accident. Back injuries that don’t require surgery or extensive medical intervention or therapies will attract a lower award. Severe shoulder injuries £14,600 to £36,500 The shoulder(s) can be fractured or damaged as a result of an impact with a hard object, such as slipping on a wet floor. This upper end of the scale covers shoulder injuries relates to neck injuries after an accident and may have an impact on breathing. There are lower scales for lesser injuries to the shoulder. Pelvic injuries £3,000 to £99,500 A broken hip is a common injury facing someone who has slipped or fallen. The bottom end of the compensation scale covers a fractured hip from which the claimant is fully expected to recover. The upper end of the scale is awarded when the fracture is considered extensive resulting in intolerable pain, as well as issues that affect the spine etc. Broken wrist £2,675 to £3,600 When someone falls or slips, they will often place their arm out to break their fall. This can result in a wrist fracture and in this case, a simple fracture would attract the lower end of the award. Knee injury - minor Up to £10,450 This includes bruised or twisted knee, along with discomfort and aching. Recovery is likely to be complete but may take several weeks or even month. Minor knee injuries that include surgery may attract the higher end of the claim. For more serious injuries, the award bracket increases significantly depending on the severity and impact of the knee injury. You may have more than one injury and you may also be expected to deal with pain and other issues for some months, or even years, to come. Our team will ensure that your case attracts the maximum compensation award so that you have no financial burdens as you recuperate from your accident. There wa­­­s no wet floor sign and I slipped on a wet floor can I claim? Slips, trips and falls are particularly costly to a business and as such, the Health and Safety Executive (HSE) has strict wet floor signs regulations. They cover the safe technique of wiping up spills on floors, as well as how to use the signage correctly so that people are genuinely aware of the hazard and take evasive action. Unfortunately, despite regulations and guidelines, they are sometimes not followed or actioned. And so, if you suffered a slip or fall and no wet floor sign was present, this would be a clear breach of the duty of care of the employer, retailer etc. and you would have a claim for compensation. But it may also be possible to claim even if there was a wet floor sign present. The issue that needs to be born in mind is – was this sign visible? Was it placed in a position that meant you could clearly see it? There have been successful cases of people making a claim for slipping on a wet floor because the sign was facing the wrong one, it was only visible to people walking in the opposite direction and so on. Supermarkets are busy places and when you perform your regular shop, you expect to be safe. What you don’t expect whilst browsing the aisles is to slip on a wet floor. But accidents can and do happen. When things are spilt on a floor, the supermarket will have an on-duty cleaning team who are expected to attend the spill immediately. But sometimes, how they clean up the spillage can make the hazard worse. If you have slipped on a wet floor in a supermarket, you might have a valid claim for compensation, just like the claimant in this next story. A shopper in Nottingham slipped on a grape left on a supermarket floor, injuring her knee in the process. Embarrassed at her fall, she left the supermarket as soon as she could. Staff were helpful but the next day, her knee was so painful she visited the doctor. She also rang the supermarket and asked that her accident is recorded in the ‘accident book’ as it wasn’t on the afternoon it happened. After some negotiation, she settled for a compensation payment of £3,000. The decision went in the claimant’s favour because it was felt that the supermarket was not diligent enough in ensuring that the supermarket was safe for shoppers. Staff within the fruit and vegetable department should be actively looking for hazards and obstacles and when there is a slipper or wet floor, should call the cleaning team immediately. Slips, trips and falls is the single largest category of non-fatal workplace accidents. Again, spills or slippery floor surfaces, inside and outside, should be maintained to a high standard to prevent accidental slips and falls. But they do happen such as a claimant who slipped on leaves on concrete steps that should have been swept daily. If there is a duty of care breach, compensation should be forthcoming. A teacher from Essex received a settlement of £230,000 after slipping on a ketchup sachet on the school corridor. The overall amount took in legal fees and other costs, with £90,000 of the settlement awarded as compensation for his injuries, as well as the pain and suffering caused. The slip resulted in particularly nasty injuries resulting in the claimant being off work for some time. It was also expected that he would continue to suffer from ‘nuisance injuries’, e.g. pain etc. for some time to come. The argument was based on the fact that he felt the school’s duty of care to him had been breached because due to cutbacks, there were not enough cleaning staff on hand to maintain the corridors and areas of the school. This means that hazards such as spilt food were not effectively cleaned away, resulting in the teacher slipping and suffering extensive injuries to his leg, knee and arm. Has this happened to you? If so, why not use out slip and fall compensation calculator to see what you could be awarded? From restaurants to pubs, cafes and more, wherever you visit, there is an expectation that the places, inside and out, will be safe to use. This means businesses and organisation having maintenance and cleaning teams onsite to deal with risks and hazards as they arise. It also means the business, organisation or the local council, for example, understanding what the hazards are and acting accordingly. If you feel, for example, that your slip in the car park could have been avoided if maintenance had been higher, then you may have a compensation claim. The team at Accident Claims will take an objective look at your potential claim, feeding back to you what needs to happen next in order to get your case started. Slipping in a public place, such as on an icy pavement, could also be a cause for a compensation claim. This story of an elderly gentleman slipping on an icy pavement shows how complex personal injury claims can be. The accident happened several years ago but the case only came to court in 2017. On an icy morning in 2012, the gentleman slipped in a council car park on the ice, breaking his ankle. He made a claim against the council for failing to grit the area properly. The court refused his claim, saying that the council had taken all reasonable steps. But the claimant fought on, taking his case to the Court of Appeal. His case was that the council should have had a ‘proactive gritting policy’ – he fell at 10.30 in the morning with temperatures hovering around freezing. The council said they had been warned of the freezing temperatures and a team had gritted the car park in the early hours of the morning. But, they said, the salt they had was earmarked for highways and, so they were working with limited resources. The claimant is still awaiting the decision as to whether his £11,000 compensation claim will be successful. But other claims for slipping on ice have been successful. A prison warder was forced into retirement after suffering a slip on ice whilst at work. His ankle injury was so severe, that amputation may be needed. He won £500,000 in compensation. Water – from a freshly mopped floor to spills from flower buckets in supermarkets, the biggest culprit for making a floor slippery to walk on is water. Cleaners – chemical cleaners are used in a wide variety of places, from the shop floor to the commercial kitchen. If used incorrectly, they can leave a residue which can leave a top slippery layer on the floor. Liquids – water is not the only liquid to cause a problem with floors. Anything from spilt oil and grease, to fuel, can lead to a slip hazard. Drinks – restaurants, cafes and pubs are just three food serving locations that must ensure any spilt drinks are mopped up quickly. Takeaways, including fast food outlets, also have the same responsibility. Spills – spills of any kind lead to a slip hazard. Some organisations will have specific policies that relate to how some spills are cleaned up, such as in the pharmaceutical industry. Leaking roofs – with heavy persistent rain, roofs can leak and where this is the case, action needs to be taken – and quickly! Leaking containers – from large oil vats to drums containing fuel and other substances or liquids, leaking containers can present a serious concern and slip hazard. Again, many companies and organisations have protocols for dealing safely with leaking containers, and how to ensure health and safety of everyone in the area. Burst pipes – there are some things that cannot be foreseen, and burst pipes are one of them. But when it happens, a company or organisation is expected to identify the hazards and reduce the risks of slipping on wet floors. The floor materials being unsuitable – sometimes, the floor itself is the slip hazard. Some tiling finishes, for example, can be incredibly slippery as soon as it becomes damp or wet. Combined with incorrect footwear, the slip hazard can result in painful consequences. If you have slipped on a wet floor at work or in a public place and have been hurt, you may want to know more about making a claim for personal injury compensation. But you may not know who to turn to for friendly advice and support. If you would like more information, you can call us on 0800 073 8801. Our helpline is available 24 hours a day, seven days a week. Why not start the conversation with us today? This guide shows you the importance of ensuring floors are kept clean and without slip risks. If you’ve lost income as a result of an accident, then this page should help you.